People in this community can probably name a few big names from the world of politics who fought brain tumors. But this week, we feature 5 people who are fighting brain tumors in public in their own ways. This includes a young woman with 1.5 million youtube followers, an E! Entertainment journalist, a NASCAR rookie, and a schoolteacher with a loyal audience of preschoolers. 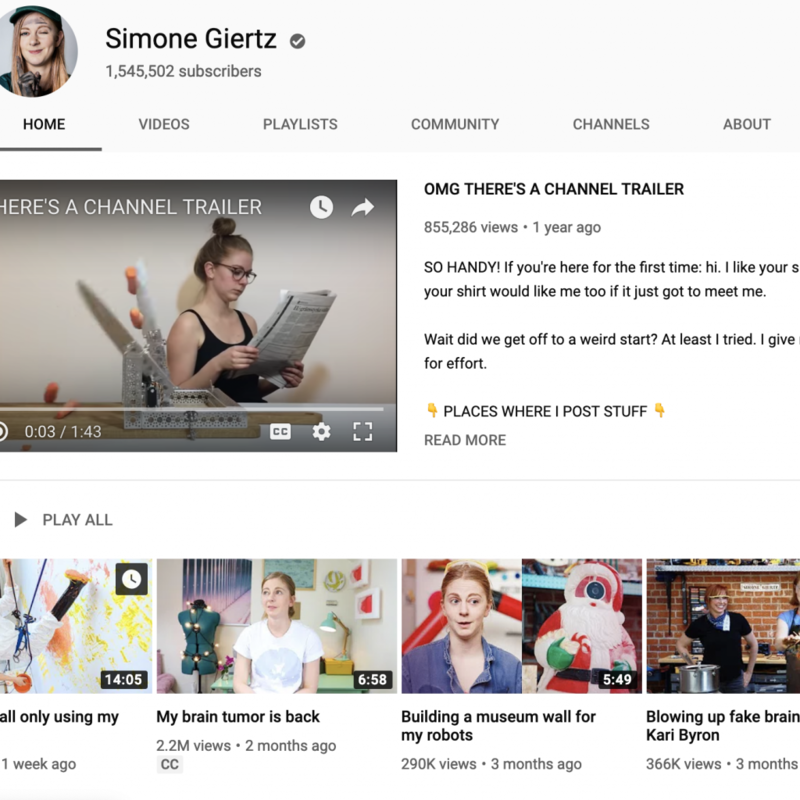 Robot builder Simone Giertz found out earlier this year that she’ll be undergoing 8 weeks of radiation following the removal of a brain tumor, but that hasn’t stopped her meteoric rise in popularity on YouTube. What’s next for Giertz might even include the first television show in space! This is a heartwarming story about young D.C. public school teacher, Kassandra Johnson, who had just given birth to her second child when she started showing signs of a brain tumor. She was afraid she’d become a statistic. Instead, her community, organized around a group for millennial moms of color called District Motherhued, rallied to help. Moms who didn’t even know her donated baby supplies and supported her GoFundMe. Thanks to the support of her community and the success of her surgery, she hopes to return to her students this spring. Rebecca Mandel was diagnosed with a brain tumor in her right frontal lobe when she was just 15 years old. Through the years that followed, she managed to graduate from high school and then college, even as she found it difficult to organize and communicate her thoughts. Her senior thesis required six months of writing eight hours each day. Rebecca found that meditation and, surprisingly, Virtual Reality headsets both helped her re-train her brain, and has since founded a company called Lucid Care to help other patients with cognitive impairment. Matt Tiff is a NASCAR rookie that, just three years ago, began experiencing symptoms such as acute pain from artificial light, feelings of claustrophobia, and even heading strange voices in his head. This season he debuts as part of the Front Row Motorsports team driving car No. 36. Just one year after Emmy-winning journalist Maria Menounos found out that her mother had been diagnosed with glioblastoma, she was diagnosed with her own meningioma brain tumor. At this year’s SXSW she announced that she had begun work on a documentary about her journey through brain tumor treatment in her continuing efforts to dispel misconceptions and inspire others.